Exposure, facing what you fear the most, in a gradual, supported way, is the key treatment for OCD. It may involve writing scripts about feared outcomes and rereading them repeatedly, or tolerating an environment that feels disorganized in some profoundly disturbing way. Always it is specifically tailored to your particular anxiety. A trained therapist helps to fine-tune the exposure planning and get you started actually doing the exposures. 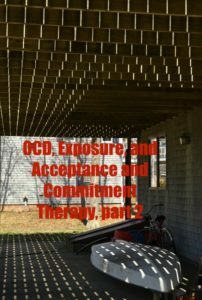 Acceptance and Commitment Therapy for OCD always includes exposure (ERP). ACT teaches all of us ( not just those with OCD) to “defuse” from our thoughts. The ability to make abstract associations (eg. a picture of an apple = an apple) fuels much of human achievement, but also makes us vulnerable to being “triggered” by our anxiety and depression. A picture of a spider causes physical reactions in people with spider phobia. A door knob in a public bathroom can be so strongly associated with HIV by a person with OCD that it takes enormous courage for him to touch it. “Defusing” from our thoughts means recognizing them as coming from our own minds rather than from objective reality. ACT teaches us that what goes on in our minds is a set of “private events”, enchained with our past and our fears about the future. It’s our “stuff”, baggage that gets in the way of our perceiving our real lives. We all have it, and when we learn to recognize its patterns it is much easier to learn to disengage from it. This works for everyone, including people with OCD. It helps to externalize the thought contents. – Is this me or my OCD talking? ACT helps increase people’s motivation to face exposure treatment, because it is about values. A value is not a goal, like earning a degree or getting married. If you value education and a loving intimate relationship, your actions in pursuit of them have meaning, regardless of what the actual outcomes may be. Values are life directions. They are also unique to each person. 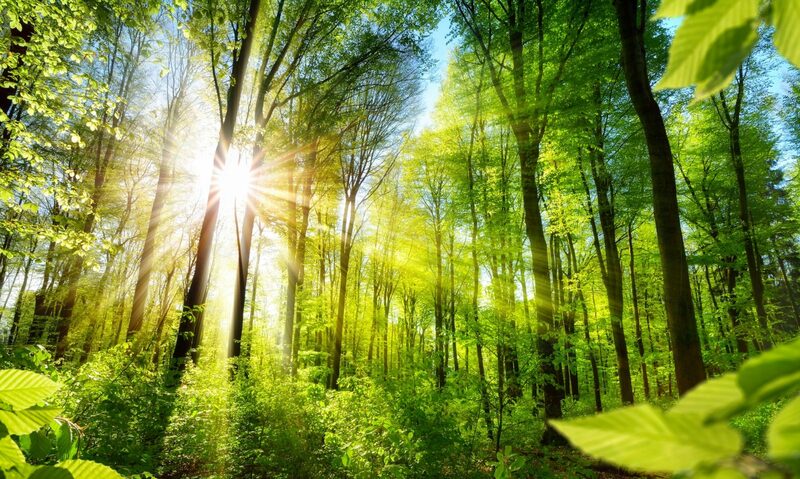 – For example, some people care deeply about the environment and little about spirituality, others the reverse, and some people care deeply about both. It can be a hard road sometimes for people to find/remember their values. It may take perseverance to help the person find something he or she wants enough to motivate him or her for treatment. Exposure is acceptance, and it will change your relationship to your fears. It is unlikely that they will ever “go away” entirely, even if you take medications. But it’s a lot different to notice what your OCD is telling you (and so be able to disengage from it) than to be grabbed by a terror that causes physical anxiety symptoms. Gradually, people learn to apply what they learn in exposure sessions more generally. It’s not just that you get used to touching the doorknob. 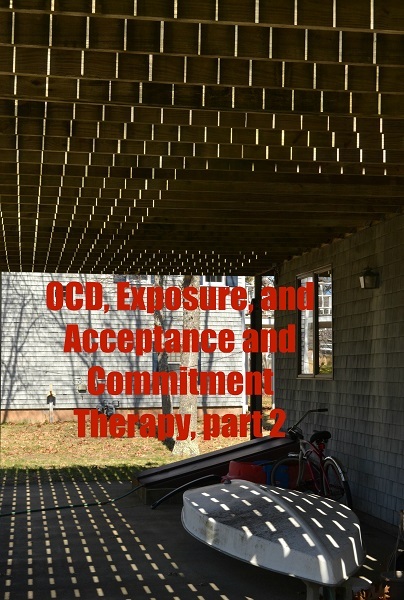 You now recognize that obsessive fears about contamination, being aggressive, “unlucky” numbers, etc., are ALL just your OCD and can, with perseverance and courage, be disregarded. ACT teaches us that once you recognize your “stuff” it loses much of its power over you, and you are free to chose what you do with your life.